Charlotte Pence NPR coverage of Charlotte Pence: News, author interviews, critics' picks and more. 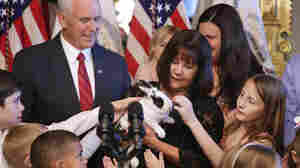 March 19, 2018  Bunny Marlon Bundo is featured in a book by the vice president's daughter Charlotte and wife, Karen. But even pets in Washington cannot escape controversy.